DEconstruction Magazine | Say what you want, Say it here! Say what you want, Say it here! The magic of the holidays is officially in the air. Halloween has come and spooked us all and sufficiently aided to my growing addiction to candy. Thanksgiving reminded us all why turkey is so good and how nice it can be to spend time with family. However, with these two holidays down, the big shebang is still to come, CHRISTMAS! 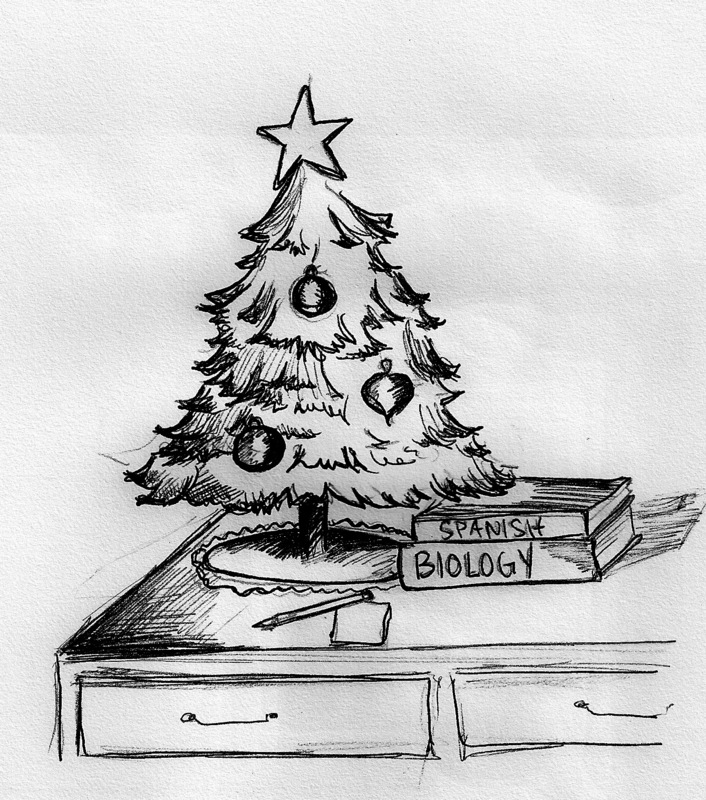 Unfortunately, we still have a few weeks left in the semester before we can really start celebrating. Worried that the delay in celebrating might turn you into a Scrooge? To that I say, “ Bah Hum Bug.” Christmas can easily be celebrated in the comfort of your own dorm room or what ever humble abode you call home while at school. What does your dorm need first to get in the spirit of Christmas? A tree! It is seen as a staple in many homes during the holiday season and usually proudly displayed in a window that makes the tree visible to passersby. Unfortunately, getting a real tree into a dorm room could be quite the challenge but do not let this minor detail damper your spirits. I have never had a real Christmas tree because apparently they are a “fire hazard” so you can always go the artificial route. However, artificial trees can still take up a lot of space and can be a little pricey. If your heart is set on a tree, you can use a little imagination and a lot of green construction paper and glue to make your own Christmas tree and hang it on your wall. Another option is go outside, pick a tree and decorate it. It might not be the same thing as having your own personal tree but it can be better because you get to share it with others. I love going for rides with my family to see the crazy light displays in my community. Seeing a house covered in multi colored lights, with a wreath hanging on the door, and those creepy mechanical reindeer on the front lawn, signify that Christmas is here. The good thing about living in a dorm is that you don’t have to pay the electricity bill, which gives you a lot of leeway in the amount of Christmas lights you put up; however you will have to run it by your roommate. You can easily buy lights and garland at Happy Harry’s or any other local convenience store and decorate your heart out. Hang the garland and lights around your room any way you would like. Make the room come alive with the spirit of Christmas. 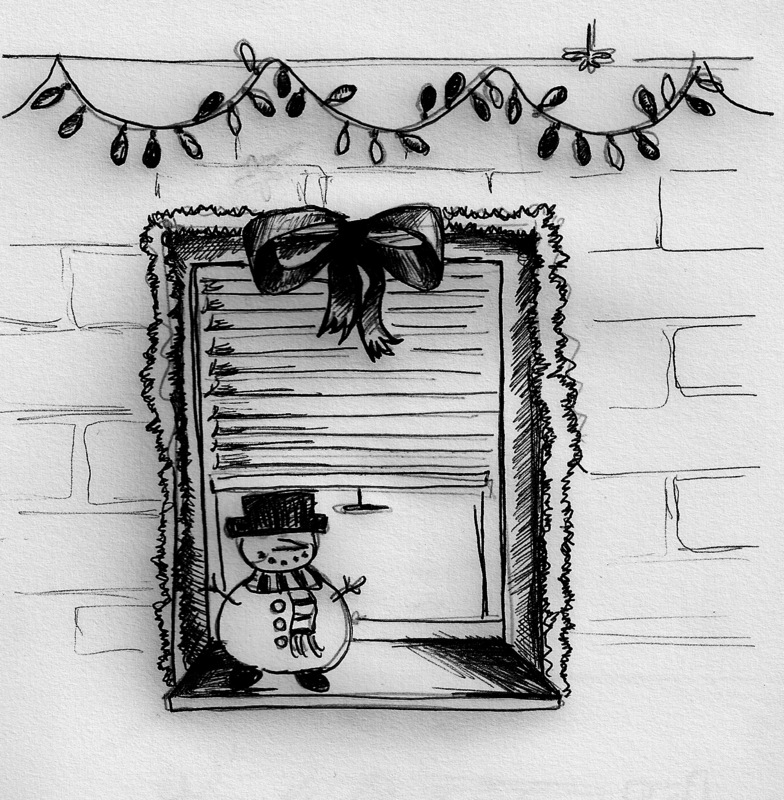 Don’t forget that you can use your door for a canvas of your Christmas spirit too. Just because you have decorated for Christmas does not mean that you are ready for the holiday. Christmas music always makes me feel cheery, no matter what time of year it is. Pick out your favorite Christmas CD, I recommend *NSYNC’s Christmas album. Make some hot chocolate, put on a Christmas sweater, and then just try to not be in the holiday spirit! Another easy thing to do that helps bring Christmas cheer, is to watch Christmas movies! If you didn’t bring any to school, don’t fret; ABC family has the 25 days of Christmas with a different Christmas movie on every night. If you aren’t interested in their movies you can always watch one on YouTube or go to a video store. Decorating your room, listening to Christmas music, and watching Christmas movies are still no replacement for actually going home for Christmas. If you can’t make it home this year for the holidays the spirit of Christmas, and Santa Claus, will still find you. There is still one more thing you can do that might make not going home for Christmas seem a little less depressing: help those in need. Check it out: Our official website is up and updated. The weekly meeting of Deconstruction will be held Wednesday at 6:30pm in the Scrounge at Perkins Student Center. We’ll be discussing upcoming fundraisers, writing, and such, so feel free to drop by. Tonight at 10pm, Deconstruction will be featured on What in the Hall?!? on STN (ch. 49). If you can make it, stop by the Trabant Patio between noon and 3 pm on Friday. We’re helping out our friends at Relay for Life while handing out magazines. Next Monday we have the kiosk reserved, so let us know if you’ll be available to man the booth in Trabant. Hope everyone’s having a great week and we look forward to seeing you soon. Decon on What in the Hall?! You can check us out on “What in the Hall? !” on the university’s STN (Student Television Network) at 10pm on Tuesday, April 15th. If you live on campus, tune into channel 49. Additionally we’ll be distributing magazines and helping out Relay for Life’s Life Faculty Arrest on Friday, April 18th between 12-3pm on the Trabant Patio. It’s a worthy cause, so please come out and help spread the word about RfL and Deconstruction. AFTER the writers strike this year, the Oscars had trouble keeping audiences watching. Not only was the lineup of nominated films—such as There Will Be Blood, No Country For Old Men, and Michael Clayton—unheard of by most, the films were too artsy to invite the public eye. 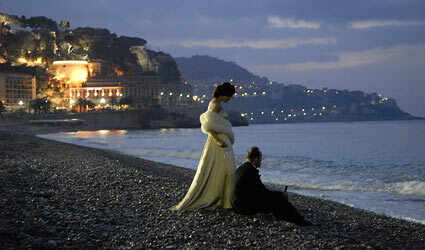 The Best Foreign Language Film Award has had a history of favoring art house cinema. The trend continued when the Oscar went to Germany’s The Lives of Others last year. This year’s winner, The Counterfeiters from Austria, takes on a weighty subject, The Holocaust, without really getting to the center of it. While most Holocaust films touch on the graphic and malicious nature of genocide, this film takes another approach. It tells the true story of a group of Jews who are chosen to work at a concentration camp as counterfeiters, illegally copying the British Pound and US Dollar to fuel the Nazi plan of bankrupting foreign economies. The group, led by former conman Salomon Sorowitsch (Karl Marcovics), must work to stay alive under the supervision of Nazi war criminal Friedrich Herzog (Devid Striesow). They are given comfortable places to sleep, stuffed with food, and worked strenuously for the Nazi regime in a sealed-off bunker. All the while, they can hear other Jews being tortured and murdered just over the wall. Sorowitsch’s top priority is staying alive, but a younger idealist in the crew plans a strike in hopes of sparking a revolution. The tension builds as the group encounters trouble reproducing the US Dollar. The film’s cinematography, dark and grainy, adds a stylistic glow to the scenes. The handheld camera shakes from scene to scene. At times, the style is overdone, distracting from the significance of events on screen. Since the living conditions for these Jews were not as bad at the real concentration camps, the film’s sets worked well. Although this film digs persistently to find a new path through the Holocaust—diverging from its forerunners Schindler’s List, The Pianist, and Faithless—it doesn’t separate itself from the pack. The dreariness and gloom of these movies has been touched on already. Still, Filmmakers keep returning to the Holocaust to find new material. The problem is that eventually the realistic nature of the Holocaust comes only as memory of a film. An example is James Cameron’s Titanic, which emptied many bags of buttered popcorn, but also distorted a real tragedy. This is not to say that tragic history should not be touched. However, once a real-life occurrence—with the people who died or the families who were affected—becomes an entire genre, it begins to market a mere interpretation of human tragedy. Beyond its social failures, The Counterfeiters works in a detached way – the audience is not invited to interact with the characters. The protagonist Solomon, with his own set of moral failings, is hard to trust. Therefore the narrative rolls disjointedly back and forth, and the audience is given the ending first. The result of this is a loss of emotional impact—rather, it seems to declare itself a film, or just: another Holocaust film. 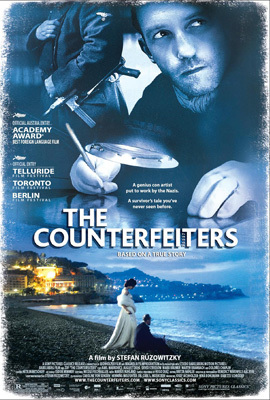 Most critics and the Academy Awards declare The Counterfeiters to be a work of art and originality. Then why didn’t Paul Verhoeven’s Black Book, another Holocaust drama, win Best Foreign film last year? 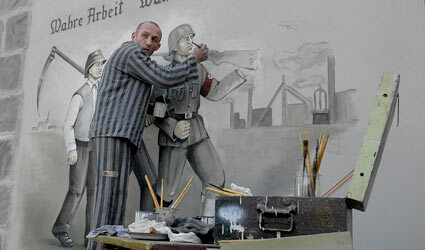 Although the Holocaust itself will forever haunt the memories of the world, filmmakers need to find new subject matter. A more deserving film was the more uplifting tale of Jean-Dominque Bauby’s dealing with paralysis, The Diving Bell and the Butterfly. Nevertheless, since the Academy Awards received some of their lowest ratings this year, it probably makes little difference who won. Spring 2008 Issue is Here! First, thanks to everyone who came out to the kiosk on Wednesday. It was a lot of fun and we distributed a bunch of magazines. We’re waiting until after Spring Break to distribute to the rest of campus, but you can read the entire magazine online right now. It’s available through our website, and you can link directly to the .pdf file here. We hope everyone has a fun and safe Spring Break and we look forward to seeing you all in two weeks! There’s a lot of exciting plans for writing and fundraising on the horizon, but we can’t spill the beans just yet. Also, remember to take the survey and give us feedback on the magazine. Hey everyone! Come hangout with Deconstruction this Wednesday, March 26 from 12-3. We’ll be in Trabant Kiosk B passing out magazines and holding a raffle for $25 gift certificate to the delicious Iron Hill Brewery. So if you want to support our magazine, if you want to help distribute it, or if you’re just curious about what the heck we do, come stop by :)!